If you’ve been vegetarian for any amount of time, or ever even just casually glanced at the menu of your friendly neighborhood co-op cafe, you’ll surely be familiar with “The Bowl.” That upside down hardhat brimming with healthy and yummy ingredients. But what sets a bowl apart from other types of entrees? Let’s go over some of the unique characteristics that give a bowl its bowlness. At its most basic, a bowl is made up of a grain, a green, a ‘tein and a sauce. In general, all of the components are prepared very simply, except for the sauce, which is the main flavor component. Of course rules are made to be bent if not broken, but just because you put a bunch of stuff in a bowl, doesn’t make it a bowl proper. Let’s examine each component. The grain is usually brown rice or quinoa, but it doesn’t even have to be a grain per se, just something wholesome and starchy, that will soak up lots of sauce. I use buckwheat soba noodles in this example. Barley, millet, amaranth, and bulgur are all great choices and I’ve even had whole wheat cous cous find its way into my bowls. The greens are usually abundant and they don’t have to be green, any veggie will do. They’re often steamed, but roasted with just a little olive oil, salt and pepper is a great choice, too. A simple saute with garlic is about as elaborate as it gets when bowling, though. Common veggie candidates are cauliflower, broccoli, brussel sprouts, dark leafies like kale, zucchini… and often, especially at restaurants, you’ll get a nice mix of all of the above. Sometimes they’ll try and skimp by making the veggie mix half carrots, so if I’m ordering out I’ll often say “No carrots!” Nice try, cheapskate bowl makers of the world! 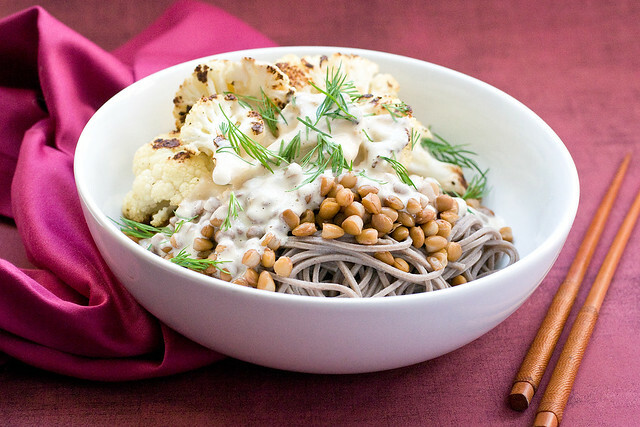 I’ve roasted some cauliflower for this bowl because it brings a deep toastiness to the bowl, which is beautifully offset by the tangy sauce and mellow soba noodles and lentils. The protein, again, is often very simple. If it’s a bean, it’s simmered just until tender and that’s about it. For tofu, a fairly dry run in the skillet is all it needs, a little salt and pepper. At most, it’s marinaded and baked and at the very least it’s steamed. Tempeh is treated fairly similarly. There are times when the protein and the sauce are combined. Maybe it’s a BBQ tempeh or a curried lentil. I think that’s getting into iffy territory, sneaking away from the definition of a bowl. But again, still permissible depending on what the other ingredients are. I’ve used my favorite…plain old brown lentils in this bowl. They’re unfussy, full of nutrition and tasty as all get out. I keep a container of cooked lentils in my fridge at all times, and there are even a few canned or frozen varieties out there. If you need to cook them on the spot, no biggie, they take only 45 minutes or so. Now the sauce is what it’s all about. Here you can go for the gusto. In a way, the rest of the bowl is really just a vehicle for the sauce, which should be bursting with flavor, overflowing and smothering everything in its path. Still, though, the ingredients should be relatively simple. Instead of using 10 different things to get the flavor you crave, use a little finesse. Go for minimal ingredients that have strong flavors. Here I employed a classic duo: miso and tahini. Miso with its aged, tangy saltiness and the ethereal nuttiness of tahini make a creamy dreamy sauce that’s barely any work and requires no cooking. Bowl heaven! So that’s what we talk about when we talk about bowls. The possibilities are endless. And so are the puns. Bowl me over. Cook the lentils if you don’t already have prepared ones (1 cup dry is about 2 cups cooked.) While the water for the soba is boiling, preheat the oven to 425 F and chop the cauliflower into large florets. It’s easy to do this by chopping it in half lengthwise, pulling of the leafy base and then pulling off the florets with your hands. Line a large rimmed baking sheet with parchment paper and spray with non stick cooking spray. Toss the cauliflower on the with the olive oil, salt and pepper. Roast for about 20 minutes, flipping once, until aromatic nicely toasted. In the meantime, place all dressing ingredients in a small blender. A Magic Bullet works great here. Start with 1/2 cup water, and then add another 1/4 to thin, if you like. Divide soba noodles into big bowls. Top with lentils, cauliflower and plenty of sauce. Garnish with herbs and serve! Isa I wish I was eating this right now! I love bowls because I love eating with chopsticks and the two go well together! How do you cook your lentils? They look so light and airy, not stuck together at all. I am definitely trying this. Yeah, I want to know how you got the lentils like that too! Looks awesome! I am making this immediately. Except with brown rice, cause I have no noodles. And spinach, cause I have no cauliflower. It’s all good though, it’s still a bowl! I’m with those who are wondering about the lentils. I’ve never seen them look so airy like that. Such lovely bowlness! So pretty and yummy looking. And yes, we must know what kind of magic lentils those are! I am really liking the sound of this! Nice and healthy and tasty! whats the difference with Miso types? I’m quite keen to make this but have brown rice miso, would that work? Yes, I should have added that any miso you have will work, but some are much more salty than others so you may have to adjust ratios a bit. So Good! Will you marry me? My lentils stay whole and distinct when I cook them with a little salt – maybe 1 tsp per pound of lentils. They still get tender, just not mushy. The trick is to bring them to a full boil in plenty of water, and then lower the heat to as low a simmer as possible, just until they’re tender, then drain immediately. I do salt the water a little, too. But not sure if that has anything to do with keeping them intact. It makes them more flavorful though. Where do you buy buckwheat soba noodles? Can’t wait to try this recipe! I got mine at Whole Foods but if you have a Japanese supermarket you can probably find them there, too. I made this tonight. I had everything on hand, except my noodles were brown rice and I only had brown rice miso. It was so good!!! The kids liked it too, the 1 1/2 year old gobbled hers right up, the 4 1/2 year old chose to have her bowl with plain noodles topped with only cauliflower (4 1/2 year olds!!! ), but she loved hers too. Thanks! Made this with Quinoa and Kale, so yummmay! Asparagus and rice–could have sworn I had soba noodles in the pantry! opted for just a single bowl, so had asparagus instead of the cauliflower. Yum! I now have a jar of lentils in the refrigerator for more bowls. This sauce … tried it with buckwheat soba, collard greens, sweet potatoes, and some oyster mushrooms sauteed in a little sesame oil, and it’s awesome. I’m kinda kicking myself because I’ve attempted much more complicated tahini-based sauces, and this wins by far. I kinda hate you right now. Mm, I just had a bowl for lunch. Lentils, brown basmati rice, spinach, and orange bell pepper. Never found a recipe on here I don’t like! I just ordered a huge box of soba noodles online so I can make this over and over again. Another sauce that has a lot of punch is the copy-cat “yum sauce” based on the signature sauce from Cafe Yum in Portland. Love all this new sauce option, think it is time to buy “appetite for reduction”!! All the flavours mixed so well! I would not want to live in a world without you, Isa Chandra Moskowitz! I am eating this for breakfast with a head bowed in reverence. Katie, I ate my leftovers for breakfast, too! Nom nom nom nom!! what can I say? Just…. WOW! I want to make this dish. I want to play around with the ingredients, yet still get something this photogenic. Can this picture go on Pinterest, por favor? This was so good! The sauce is amazing! We had left over lentils, so I cooked some rice noodles and roasted Brussels sprouts and it was delicious!! This sauce is out of control AMAZING! 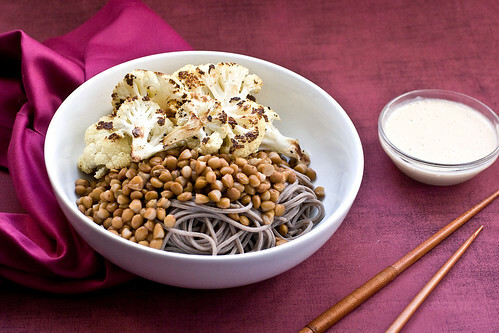 Currently eating a variant on this, substituted the lentils with soybeans (thought it might pair up nicely with the miso) and the soba with brown rice ’cause it’s what we happened to have on hand. Also added some chopped asparagus ( because heaven) and bean sprouts for a texture contrast. Delicious. Thank you much for the inspiration. Thank you for all of your fabulous recipes. Your sharing them has lead me to buy your cookbooks. You Rule! MMM this looks soooo good and easy! Ill have to try this recipe. Thanks! Of course now I must buy more cauliflower and lentils so I can make this very soon. HOLY TOFU IT LOOKS SO GOOD. Seared tofu, kale, cauliflower, noodles, yum. However, I found the dressing to be more tahini-y than I thought it would be. I accidentally bought “lower sodium” white miso. Maybe that’s why? Scrumptious sauce! Really hit the spot, thank you! Made this last night… wonderful. The sauce will be going into rotation — thank you! Incidentally, my immersion blender with it’s little “smoothie cup” container worked great for making the sauce. Um, yeah, super delicious! I also used the immersion blender for the sauce (before seeing Kate’s post above!) and it did work great. I used canned brown lentils (not WF brand – can’t remember the brand – but I got them at Whole Foods) and they are a great consistency. Not only does this sound delicious, but it looks super healthy too! It just goes to show that vegetarian food is more than just nutritious, it’s downright delicious too! Oh lord. This is the stuff of gods. I’ve been ppk’ing for the last two weeks but the second this little piece of heaven hit my mouth. Ahhhhh! So good. Keep up the amazing Isa. We make this all the time (with different variations depending on what’s on hand). It’s such a tasty, complete meal! I love the simplicity, and there’s nothing better in the world than roasted cauliflower. Also great with seared zucchini and onions, and baked tofu in place of lentils. Thanks so much for a lovely recipe. First time poster here, but I am compelled to comment on this deliciousness. I mean… really DELICIOUS. $25 bowl at Cafe Gratitude be damned! I haven’t cooked this yet, with the exception of roasting cauliflower. SO GOOD. Thanks for turning me on to this–many more friends and family are also now roasting cauliflower, too! NOM! The sauce was a little bit salty, so I’ll definitely use low-sodium miso next time. I also subbed broccoli for cauliflower, because my boyfriend thinks cauliflower is “broccoli touched by death”. Will make again! this was soooooooo good and i loved that it was sooooooo fast! the fam loved it too! This is my second time making this dish in two weeks – I think we are addicted! Thank you for such a delicious recipe that even my meat loving fiancé will eat! this was great. I just made it for dinner. I’m lazy so I used canned lentils and I also put a bit of gochujang (spicy korean chilli paste) in the sauce to give it a bit of a kick. You’ve managed to change my mind about miso! Thank you. Great recipe, as always. Simple enough to make but complex and impressive enough to feel proud. No matter what I’m going to make, I always check to see if you have a recipe for it first. I made this tonight and it was great! I cooked the lentils with a little lemon juice and salt added at the end. I used some safflower oil infused with lemongrass made for stirfying for tossing the cauliflower. It was SO good! I also sauteed the lentils in a little bit of oil with a chopped thai chile and a chopped yellow bell pepper, just before serving. Wow the dressing was awesome I loved it I added some sriracha to make it taste extra awesome. Thanks!! I have a recent obsession with all things miso + tahini. This recipe is so simple, yet so full of flavor and amazing. love this! delicious but a little steep $$ wise to make. But worth it! Yes yes very good! I added a Serrano and cilantro to the sauce it added the perfect amount of heat thanks Isa super satisfying. Kale, Carrots, Tofu Soba with Miso-Tahini Dressing | Death by Pineapple! If you make this with a giant pile of sautéed baby spinach, it takes less than ten minutes! For the past year since this went up, I’ve made a single serving of that combo using really awesome canned lentils once or twice per week. There is no excuse for not eating real food when it takes 10 minutes. Singlehandedly has saved me from the malnourishment that must come from eating nothing but pancakes. Am I missing something? All the buckwheat soba noodles I’ve checked since I’ve given up gluten were a wheat/buckwheat combo; therefore not gluten-free. Does someone know where one can get 100% buckwheat noodles? Yep, they exist. I’ve gotten them in Asian markets and WHole Foods, but I’d just google or order them on Amazon if you can’t find em. Just had this for dinner tonight and loved it. Super easy to make with really inexpensive ingredients. Now that I have miso on hand this will be a go-to weeknight meal for my boyfriend and I. I’m already looking forward to lunch! I just wanted you to know that this is my first time making miso/tahini sauce thingy. It is amazing. I accidentally spilled some on the counter. I put as much back in the container as I could, then I used my finger to wipe up the rest and lick it off my finger. Then I seriously considered licking the counter clean instead of just wiping it down with a scrubby. Haha, thanks for the smile! I bought a little blender solely for the purpose of trying this, and OH MY GOD! So happy I did. Anyone who says vegan cooking can’t be delicious needs to have this shoved in their face at once. Delicious! Freakin’ AMAZING!!! I’ve been on a Cauliflower kick lately and this was definitely a winner! The dressing is so addictive that you can put it on virtually anything!!! Just made this. I admit I had my doubts, and the taupe-on-taupe-on-taupe color scheme didn’t help, but it was SCRUMPTIOUS. The simply-prepared ingredients add up to so much more than I expected. I used red miso paste in this because it’s all I had in the fridge. I also used canned pinto beans because I was too lazy to boil lentils. This is too good not to try. And too easy not to. Thank you! hi all, Happy New Year. I don’t like tahini, any good substitutes you all recommend for this recipe? Thanks! We served this for friends – the very first time we cooked it – and got rave reviews. It was fantastic! The edits to the book version that you show here are helpful: I had to scramble a little to find the correct dry lentil volume & a recipe for cooking them, as the package had neither. Love the new book. Keep ’em coming! This in an amazing meal!! I cooked it and it is great!!! Thank´s a lot!!! GREAT recipe! I changed this up a lot, though, by using brown rice spinach spaghetti, adding sauteed shiitake mushrooms and kale, and then for the sauce I added grated ginger, chilli oil and sesame oil. I am an omnivore but this dish might turn me vegan! This is SO SO SO yummy – and, for me, an unexpected combination of ingredients in the dressing. I roasted broccoli and baby carrots instead of cauliflower to suit my family’s tastes. I have a bunch of dressing left over and as it’s still quite thick I am thinking it would work well as a vegan egg salad. I’m going to add chopped celery to it tomorrow to test out..maybe as a sandwich. THANK YOU! Maybe I’m late to the party… But now I finally know why the dressing tasted so weird, there’s a mistake in the book! I love this Roasty Soba Bowl!